Planning to see U2 this weekend in Amsterdam? Please be aware that there will be (or very limited) trains between Amsterdam Central Station and Bijlmer ArenA. You better can use the metro. Line 54 from Central Station towards Gein or line 50 from Sloterdijk Station to Gein. 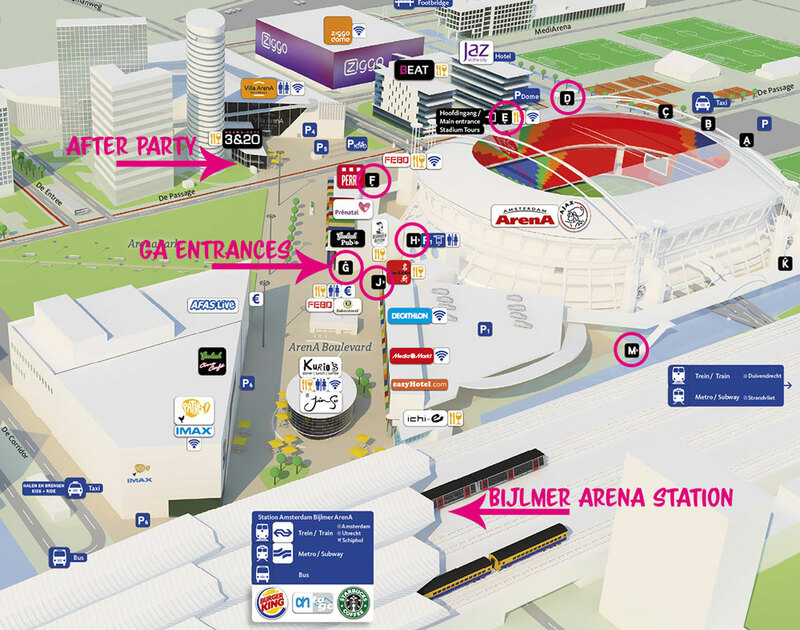 The station you'll need is Bijlmer ArenA and is just 5 minutes walk toward the stadium. Last metro's back will run shortly after 0:00 hrs, but the concert will end at about 23:00 / 23:30 (latest). So there's plenty of time to reach the last metro's back to beautiful Amsterdam. To travel by metro you'll need this OV-card (public transport cards) which can be purchased from machines on the station, or from local stores and Tourist info shops on Central Station. You can buy tickets for a day or more. Or you can buy a tourist card which includes the train to and from the airport too. In the stadium you can pay by debit card, Master Card, Visa, Visa Electron, AmEx and VPay. No cash is accepted at concession stands, the 'Major Tom' guys (mobile beer and softdrink selling point) sometimes accept cash though. Or they sell you a special 'Arena card' to get more drinks. If you have some spare time left in Amsterdam take the ferry to NDSM wharf. It's a free ride starting at the back of Central Stadion to this former wharf where you'll find plenty of great places to enjoy the sun, have a drink and grab some food. Personally I love this place called Noorderlicht (it's under the huge crane). Or go to the 'beach' of Pllekk. Be aware that taxi's can be a dissapointing experience in Amsterdam, especially when taking an 'unofficial' one from the airport. There's some scum drivers who use 'runners' in the terminal to talk you into their taxi and charge you ridiculous fares. If you want to take a taxi from the airport ALWAYS take one at the official taxi stop just outside the terminal. Here's a map of the Amsterdam ArenA and the train station with all entrances and point of interest. If you need any advice please let me know.